It is 4am in the Xilamuren grassland in Inner Mongolia. My shoes crunch through gravel as I sidestep mounds of horse manure. A herd of sheep pass by, a baa-ing blur of white amidendless green grass in summer. A row of yurts - backlit by the rising sun - slowly reveal their distinct blue geometric pattern as they catch more light. I sit on stony steps to contemplate the scene and realise there is a bug on my shoe. The city slicker in me would have gasped and tried to flick it away. Instead, I offer my hand to the bug, which hesitates for a second before skittering onto the new terrain of my fingers. A strange alignment is happening between nature and something inside me. This new sensation will return several times during my time in Inner Mongolia. From Singapore, fly via Beijing or Shanghai to Baotou, the biggest city in Inner Mongolia. Alternatively, fly into Inner Mongolia's capital city, Hohhot, through several cities such as Hong Kong and Beijing. It is possible to take a car or bus to travel from Baotou to Hohhot. The journey takes about two hours. An autonomous region in the north of China, Inner Mongolia spans 1.2 million sq km and is home to about 20 million people. It shares a border with Mongolia and Russia. 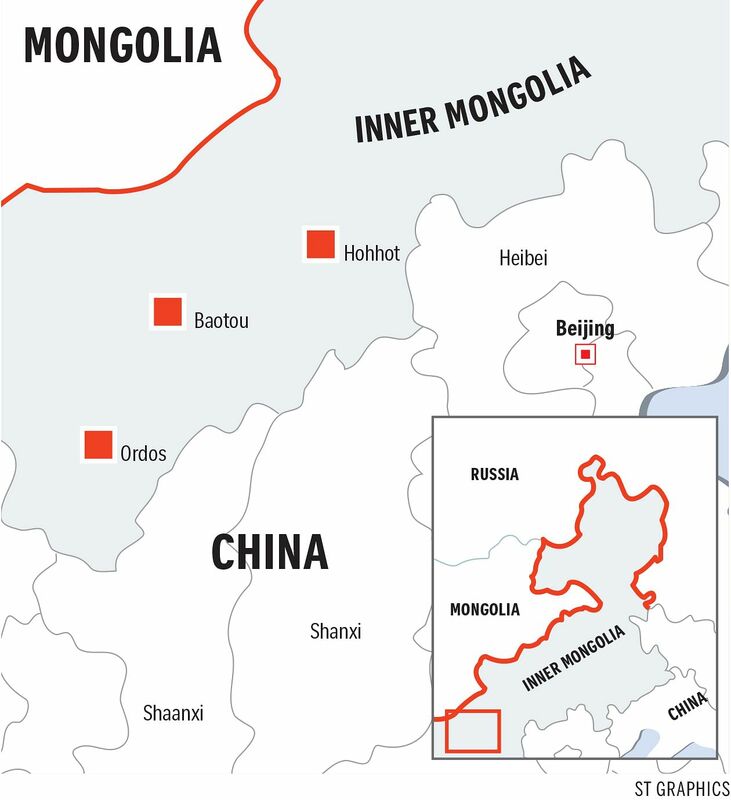 Mongolians make up about 15 per cent of the population, which is dominated by Han Chinese. Although the cities of Inner Mongolia are modern, it is the grasslands that have endured as motifs of old Mongolian life. Yurts, or dwellings traditionally made from felt stretched over a wooden structure, persist as romantic symbols of the ancient nomadic lifestyle of Mongolians. In their traditional form, these could be packed and carried away quickly when families moved to newer pastures. Our tour guide Rocky, 30, tells me that Mongolians would move before their animals ate all the grass on their chosen location, so the area could renew itself. This sensitivity to the land is often spiritually motivated, as Mongolians believe that natural elements such as grass and rocks contain spirits. These days, however, many Mongolians - if not already living in the cities - live in modern brick housing with heating in the grasslands to withstand the cold, long winters. Now, the grasslands are dotted with yurts, but these are mostly concrete constructions targeted at tourists. On the bus ride to the vast Xilamuren grassland, which is about a 11/2-hr drive from the capital city of Hohhot, I spy dozens upon dozens of yurt "resorts", with names such as Rainbow Herdman Resort and Wealthy Family Resort. We stay in the Mongolian Sacred Land Resort, specially chosen by Shangri-La Hotel as it is set apart from the others. They may not be the real deal entirely, but my travel companions and I are glad for the heating and hot water in our yurt as, at night, the temperature dips to a nippy 10 deg C.
The yurts are also comfortable, having been spruced up by the hotel staff, complete with bathroom amenities and even an in-room fragrance. The one-night stay quickly becomes the highlight of my trip. In the View-Master of my mind, these scenes linger: a horse grazing in the field with its foal; the pleasing form of the yurts under the vast sky; the cloak of stars above us at night. At dinner, we are joined by the owner of the resort, Mr Dalai, 42, who was born in the grasslands and hopes to raise awareness of their natural beauty. It is said that every Mongolian man must have three skills: archery, wrestling and horse riding. These skills are demonstrated during the annual Naadam festival, held in July during summer. "Naadam" roughly translates to "the three games of man". Through Mr Dalai, I slowly realise that there is an unofficial fourth skill - an ability to drink copious amounts of alcohol. Throughout dinner, Mr Dalai makes multiple toasts to us. Shots are downed as a gesture of thanks and goodwill. One drink favoured by Mongolians is kumis, a type of wine made from the milk of a mare, although it is not in season when we are there. Alcohol is served in cups of differing sizes. Some of the stronger drinkers in our group are made to drink wine served in large animal horns, although I am told this is only for show - the amount of alcohol is only about 7.5cm high. With a sweep of his hand, Mr Dalai says the reason the Mongolians drink so much is that, while intoxicated, they can dream that they own all the land they see before them. However, realistically speaking, alcohol helps them get through the winter. The winter in Inner Mongolia lasts for about seven months, from October to around April. Tourists flock to the grasslands in the fleeting May-to-September season. I also find that Mongolians are a practical people. There is a popular drink of salty milk tea that is served everywhere in Inner Mongolia. Made from "brick tea", a type of black tea shaped like a brick for easier storage, and mixed with milk and salt, the tea is usually consumed with small fried fritters and milk-based products such as cheese. Mr Victor Ng, 50, the Singapore-born general manager of Shangri-La Hotel Hohhot, tells me that the Mongolians of old recycled the water used to boil their meat, which explains why the tea is salty. However, the beverage, which is comforting especially in cold weather, also helps to balance their meat-rich diet. Traditional Mongolian food includes blood sausages, grilled meats such as lamb and beef, starchy oat noodles steeped in hot broth, and produce made from milk. The hard nomadic life, coupled with meaty diets lubricated with alcohol, has resulted in many Mongolians looking older than they are. However, they find ways to celebrate life too - with music. At dinner, we are regaled with songs about the grasslands by the long-haired Geriletu, a 45-year-old singer at the Sacred Land Resort. Although I do not understand a word he sings, I can hear a note of longing in his singing. Mongolian folk music is distinct, with long songs, or songs where syllables are held for a long time, and overtone singing, where the singer can create more than one pitch at the same time. However, in these modern times, singing is no longer the only form of entertainment in the grasslands. When we visit a family who lives a short distance from the resort, the children are watching on television a Chinese version of Upin And Ipin, a Malaysia-made cartoon about two boys, as the adults are hard at work cooking for an expected group of tourists, while cows graze lazily outside the house. Satellite towers also mean that there is cellular reception now, compared with a few years ago. As always, I am reminded of the pervasive links between human civilisation and nature. While horse-riding in the grassland, I think of something I learnt during my visit to the Genghis Khan Mausoleum in Ordos City - that the Mongolians were known for their oversized clothing, which helped them mount and dismount their horses easily. Khan, founder of the Mongol empire in the 13th century, is regarded as a hero. It is not known where his remains are buried, although the Genghis Khan Mausoleum (www.cjshl.com) serves as a memorial site. Elsewhere in the city, statues of him and horses are aplenty. There is no shortage of stories surrounding the man. In Inner Mongolia, there is a welcome toast served to guests where they must dip the fourth finger of their right hand in a bowl of alcohol and point the finger upwards and downwards, followed by a stroke across the forehead, before drinking it. This represents their blessings to the sky, to the earth and to their ancestors. According to Mr Ng, the story is that Khan used to have many enemies and, by dipping a special ring into the cup, he would be able to tell if his drinks were spiked with poison. Today, it is largely ceremonial and, for guests who do not drink alcohol, such as myself, a bowl of tea will suffice. Ceremonies are important in Inner Mongolia. A familiar sight is the sacred aobao - a mound of rocks and wood often found on high ground, or at the top of mountains. Mongolians tie colourful banners on the aobao, which have prayers inscribed on them. The colours are not random - for example, white represents milk, blue represents the sky and yellow represents the earth. Standing in front of the aobao on the Xilamuren grassland, tiny banners fluttering in the breeze, I circle it three times in a clockwise direction, wishing for a safe journey as many Mongolians have done before me. I realise why I had felt some kindred connection to that bug on my shoe, and why, in the Xiangshawan Desert outside Baotou, I was transfixed by a desert beetle making its way across the vast caramel sand. Compared with the grand scale of such natural marvels, I am but one small part. Beetle, human, desert, mountain - all make up a landscape worthy of a dozen songs, echoing in the grasslands. •The writer's trip was sponsored by Shangri-La Hotels & Resorts. •A five-day, four-night Grassland Experience package, which includes a trip to the Xiangshawan Desert and accommodation in Shangri-La Hotel Hohhot and Baotou and a one-night stay in a yurt, costs 20,888 yuan ($4,536) for two people sharing one room. Packages are available till Sept 15 and include all accommodation, meals, transport and admission fees. For more information, go to www.shangri-la.com/huhhot. Inner Mongolia is a fascinating blend of cultures. Chinese and Mongolian are the region's two official languages and it is mandated by law that all street signs and public messages be bilingual. Symbols of Mongolian nomadic life abound in the city - from statues of Genghis Khan's formidable figure to faux animal pelts and Mongolian horse-head fiddles decorating public buildings. Cuisines, too, illustrate this mix - Inner Mongolians love their dishes of mutton and springy oat noodles as much as they do hotpot and dim sum. In contrast, the sovereign state of Mongolia, which is distinct from Inner Mongolia, is more influenced by Russia, having been aligned with the former Soviet Union for most of the 20th century. There are about four million ethnic Mongols in Inner Mongolia, in a population of about 20 million. Han Chinese make up the majority group in Inner Mongolia, at about 16 million. The representation of Han Chinese goes up in the heavily industrial towns of Inner Mongolia, such as Baotou, the biggest city in the region. Located in the west, Baotou is full of steel factories and coal power stations, and is rich in rare earth minerals. Our tour guide Rocky tells us the city supplied the coal used to power the Beijing Summer Olympics in 2008. Industrialisation aside, the nomadic Mongolian way of life remains a source of pride in the region, and the grasslands are the main reason why tourists come. Visitors - mainly from South Korea, Hong Kong and China - tend to visit during the summer months of May to September, when the grasslands are the greenest. However, the cities are worth exploring too. Capital city Hohhot is particularly diverse, with about a quarter of its population of three million made up of Hui Muslims - indistinguishable from most Han Chinese except for the white hats worn by men and the covered heads of the women. In the Muslim district in Hohhot, buildings have Islamic architectural features, such as green and yellow facades and minarets. The 17th-century Hohhot Great Mosque looks like a Chinese temple, with pagodas and flared roofs, but with Arabic scriptures etched on the walls. In this district, there are plenty of halal street food options. I happily tuck into a bowl of noodles at a stall run by a Chinese Muslim woman named Fatimah. I use my limited arsenal of Mandarin words to convey to her that I, too, am a Muslim. "Assalamualaikum," she says, smiling, offering me the familiar Arabic salutation of "Peace be upon you". And as I return the salutation, the world has never felt smaller.